There is more to science than changing your mind when the facts demand”you have to persuade your colleagues as well. Searching Science Citations reveals that the cohort seconding Singer, Michaels, and Ball are most often cited by themselves. Twenty years ago, a famously bad climate model almost lead to a foreign-policy debacle”it abused the Stefan-Boltzman equations by treating this planet as a featureless bone-dry billiard ball without such vexing complications as the kaleidoscopic play of clouds in the sky or the sluggish thermal inertia of the oceans. When its science was taken to task in Nature and its politics in the Wall Street Journal it soon collapsed back into the cold war factoid cemetery””Nuclear Winter” could not take the heat. 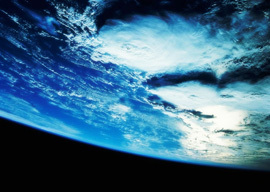 The decay of Crichton’s thoughtful critique of climate modeling, designed for a sophisticated Cal Tech audience, into ten second sound bites depleted of scientific substance finds a parallel in the empty rhetoric of Viscount Monckton, who likewise prefers simple equations to the daunting complexity of a planet with a dynamic atmosphere and oceans. But it takes a bush telegraph to raise scientific Cain in the global village, and just as Sagan was Science Editor”of a ubiquitous tabloid”Parade“Monckton is hard wired to the Daily Telegraph. Among the few skeptics on climate change who count as real players in the underlying scientific game is a member of the National Academy of Sciences and a prolific and respected author of peer-reviewed papers on the atmospheric sciences, MIT’s Richard Lindzen. Lindzen stands out like a gilded lightning rod atop a pyramid whose scientific facade is propped up by a rubbly Flintstone fill of politically appointed TV weathermen, geologists, and mining engineers righteously defending the turf (and production prospects) of coal and tar sand miners. Near the apex of respectability in this microcosm are astrophysicists who think variable star and cosmic ray research should get its fair share of the funding pie. Examining their collective bibliography suggests the core competence of most of those whose authority is invoked by publicists lies outside the realm of climate modeling. Lindzen is no stranger to technical controversy, having over the years posed many novel and scientifically interesting objections to the common wisdom in the climate change debate, focusing on how rising amounts of atmospheric water vapor could curb the rate of man made temperature rise. But each of his serial objections has been coherently replied to in the peer-reviewed science literature. Good scientist that he is, Lindzen has accepted as valid many quantitative objections to his theoretical views, and altered his stance accordingly. That’s how science works. For all Senator Inhofe’s words (often drafted by staffers) to the contrary, the iconoclast who lauded Crichton’s State of Fear on the floor of Congress no longer defends many talking points that the yack-TV pundits still cleave to. Though scarcely part of the “consensus” that so dismays the idiotarian blogosphere, he has alienated many in it”as I hope I have”by committing the unpardonable political sin of allowing scientific facts to change his mind. This has yet to register with the talking heads on FOX, and Limbaugh’s fans will spout his line on climate until the seas run dry, boil, or freeze over. 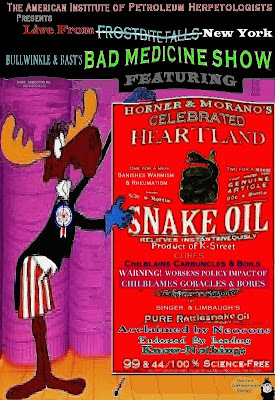 Little wonder Marc Morano, Rush’s scientific casting director, became ringmaster of Inhofe’s public policy circus. But what about Lindzen’s impact on his colleagues views? The National Academy has over a thousand members, and Lindzen has had 20 years to persuade them that man-made warming remains too uncertain to be a serious issue. Like most respectable skeptics, he began by questioning warming’s detectable existence, and pointing out that negative feedbacks could curb it in models and reality alike. Emanuel is a far cry from a liberal icon. MIT is not Harvard, and like Lindzen, and many others in high-tech establishments like MIT, Emanuel harshly criticized Carl Sagan’s attempt to use a primitive climate model as a policy lever during the Cold War, calling “nuclear winter” studies “notorious for their lack of scientific integrity “ in the pages of Nature in 1986. Bear that bipartisan commitment to the integrity of science in mind as you consider “Phaetons” Reins,” his overview of what the climate wars have come to. I recommend making the detour to read it because the atmosphere is the Earth’s most complex dynamic system, and there is no way I can do justice to the debate in so few words as I have here. Should it evoke a certain sense of dÃ©jÃ vu, you can confirm it by reviewing “A War Against Fire,” a report from the front I wrote for the (then-) echt conservative quarterly The National Interest long before Gore started running for Environmental President. Its conclusion stands. If any species of principle is at once worth conserving and profoundly endangered, it is that the political neutrality of scientific institutions must first exist in order to be respected. While the Wall Street Journal and other conservative must-reads remain willing to run words critical of media hype and politicized science on the left, all are in denial about the fact that conservatives are quitting the field in the Science Wars, abandoning intellectually serious engagement in favor of posturing on TV and preaching to the choir on op-ed pages that increasingly have no in-house science editors”or fact checkers”to whom to turn. Republicans and Democrats clearly have two very different views of the world, but there can be no armistice in the Climate Wars until both sides acknowledge that, from the atmosphere’s point of view, there can be, at most, one kind of physics.